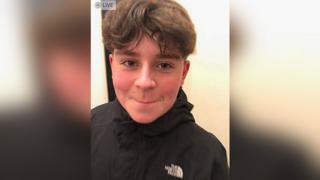 Image caption Carson has been described as "bright and caring"
Police have issued a warning about hurtful social media posts relating to the death of a 13-year-old boy in a park last Friday. Carson Price, of Hengoed, Caerphilly, was pronounced dead after being found unconscious in Ystrad Mynach Park. Supt Nick McLain, of Gwent Police, said the community had told the force posts were circulating about the events surrounding the 13-year-old's death. Police said on Monday drugs were involved in Carson's death. Supt McLain said: "This is a very difficult time for Carson's family and friends, school friends and for the community of Ystrad Mynach, but we've been told that there are some hurtful social media posts circulating about the events of Friday night. "Please remember that harassing, threatening and abusing people on social media can be against the law. "We need to concentrate our efforts on this investigation, so please help us by allowing our teams to keep all their efforts focussed on it." Both Lewis Boys' and Lewis Girls' schools in Pengam also said they would be open for five days over the Easter holidays to help children, parents or anyone else affected by Carson's death. No arrests have been made relating to the death, but the force said on Monday it was looking for whoever had supplied drugs to Carson. A form of MDMA, known as Donkey Kong pills, is also a line of inquiry and Gwent Police is trying to trace Carson's movements prior to his death.